It's festival time on Cannibal Island and everyone wants the honor of being the main course! 99 backers pledged $2,819 to help bring this project to life. to have the honor of being eaten. Like Tom mentions in the video, the art on the cards is protoype art, but the style (humorous, no blood & guts) will stay the same. Note that while Tom had the tuckbox for the game, our interim goal has been met and we will have the telescoping box as shown in Update #8! Again if we hit $3000 these cards will be in every copy of the game! Who's for Dinner? is a fast and fun take-that style card game for 3-5 players. But that's only half of the story, as a take-that game Who's for Dinner? gives you plenty of action and reaction cards that allow you to mess with other players and do sneaky things with your own cards. 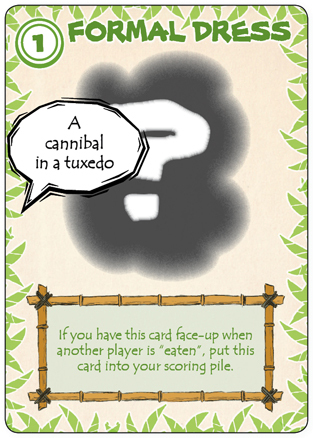 Most of your points come from being eaten, but a few cards even let you score points for eating other players. 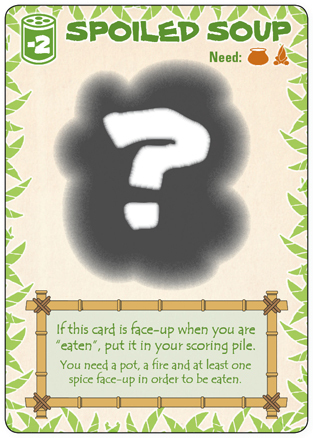 The expansion The Stranger and Other Delicacies adds role cards that add other scoring opportunities and provides enough additional cards that up to seven players can join in the fun. The cards you see above have clip-art that was used in final playtesting and production tests. However, an artist has been retained for doing new original art for all of the cards. Since the game text and mechanics are thoroughly tested but we need new art, we thought it would be fun to offer up some of the cards for Backers to have input on the art. 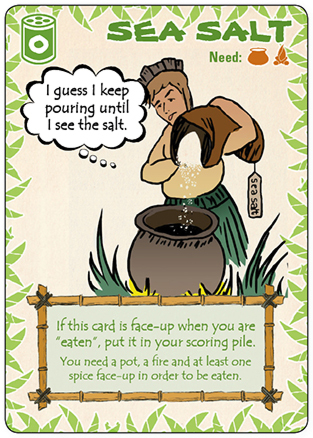 If you pledge at the $90 level, you and I will coordinate on the art and flavor text for one of the cards. Together we'll come up with a brief for the artist and you'll see your art ideas come to life in every printed deck of Who's for Dinner? Check out the gallery of current cards with the clip-art here! Then pledge at the $90 level and then send me a message with the card you want to design. I'll remove it from the gallery and you and I will get to work. As another option, you can pledge at $150 and we'll do the process as above, but the art will be for you only, so you'll have a unique design for one card. Do as a gag gift for someone or a memento for yourself! Note: All of these options reflect only the art and flavor text. All gameplay elements will remain their well-tested standard, so every deck (even a custom one) will be playable by the official rules and no one has to worry about any design by committee issues. Matthew Rodgers, game designer. They say you have to make at least ten bad games to make a good game, and boy do I have a head-start. I've been working on games ever since about the Fourth Grade, mostly roleplaying games but as I got older I grew to appreciate how board and card games were self-contained and finite... I just can't do marathon game sessions like I did years ago. To that end, I'm working on a series of light games that are also amenable to Print&Play and POD (Production On Demand). Digital printing and POD have been my day job for over fifteen years now and I want to make games that will never be truly out of print, since the PnP files will be released to the general public after everyone receives their printed edition from this campaign. This section has new info and will be updated as we hit new goals! The various meals For Two allow you and a buddy to get in on the game and save on shipping. 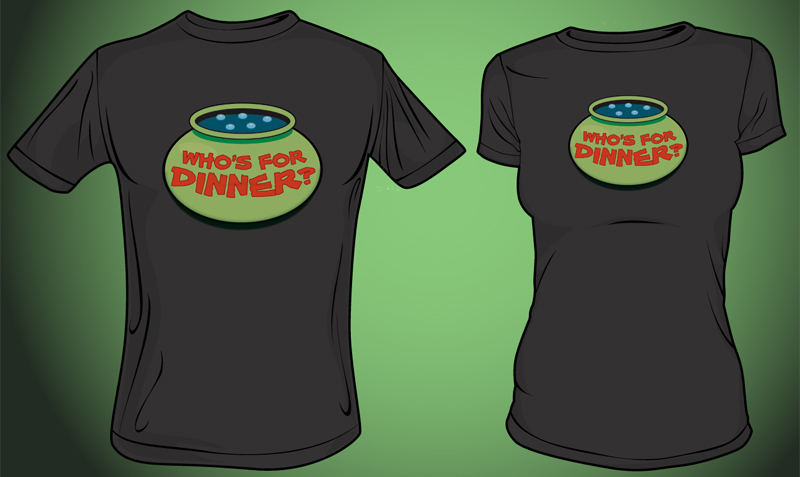 And now two new backer levels: Formal Dress for The Main Course includes everything included in The Main Course and your choice of one male or female T-Shirt printed with the Who's for Dinner? logo. Formal Dress for Fine Dining includes the Fine Dining For Two package with two T-Shirts. Both of these levels include free international shipping. 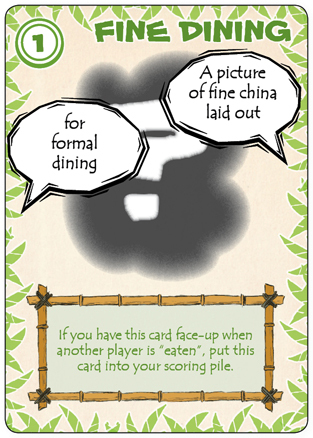 And the last new backer level: Private Dinner Party. If you pledge $500 and live within 200 miles of the Georgia/South Carolina border, I'll join you for dinner at your favorite restaurant and after we eat, we'll break in your new copy of Who's for Dinner? As it says in my bio, I'm really excited about ways to connect people... Kickstarter can help build an economy/ecosystem where consumers and providers are one and the same. We all help each other out, and everyone gets support for their dreams. That's why I'm happy to announce that Who's For Dinner? is joining Kicking It Forward. The focus for the last year has been playtesting Who's for Dinner? in both blind and semi-blind conditions. Until very recently, those test decks were all text and no art (not even clipart). So the money will be used to finalize new original art for all the cards, do an initial print run of the game and get all the rewards out to you, the backers. Once everything is complete, then at a future date the files (with new art) will be made available as Print & Play and will be available from our website (either POD or from the initial run, depending on results from this campaign). So if you're going to give this game away, why am I paying for it? Other than my eternal gratitude? Well, at the higher levels you're helping in the actual creation of the game (both monetarily and creatively) but at any level you're putting in a vote for games being produced via a system where no game is ever lost nor truly out of print. The files being released means that the game will always be available, at least in some website archive, forever. Also, while I have great respect for everyone who does Print & Play games I think that most people are willing to pay a fair price for a professionally done copy of the game that prevents them from having to do the work of printing and assembling a game themselves. Please add $3 for International Shipping for any non-US North American destination or $5 for any other country. Please double these amounts ($6/$10) for the double packages (any of the ...For Two options). Thank you! As you know the shoutouts for the d6G are brief and I couldn't include a special promo code into the message. If you heard about the project on the d6G podcast, after you pledge (at any level) send me a message with "D6G35" and you'll get a special promo card (not Plenty Big Bag as above but a different promo card). These promo cards are unlimited, so please share the code with your friends! APPETIZER: You'll get exclusive early access to the print-n-play files with the final art. The P-n-P version will remain exclusive to Kickstarter backers for at least 90 days. Your name as a backer will appear on the website homepage for Who's for Dinner? Also, you'll be putting a "vote" for this business model in the future (free P-n-P version with easy-to-get POD version available too). THE FIRST COURSE: One copy of the final card game, shipped to you. Your name as a backer will appear on the website homepage for Who's for Dinner?, plus you'll get exclusive access to the P-n-P files as above. International backers, please add $5 to defray the cost of international shipping. TAKE OUT FOR TWO: Two copies of the basic game, shipped to you. International backers, please add $5 for shipping. THE MAIN COURSE: One copy of the game, the promo card AND you'll get The Stranger and Other Delicacies expansion shipped to you when it becomes available. The game will be shipped immediately, the expansion will ship at the later date. International backers, please add $10 to help with the shipping. Note: The base game will ship in July, the September date is for the expansion. 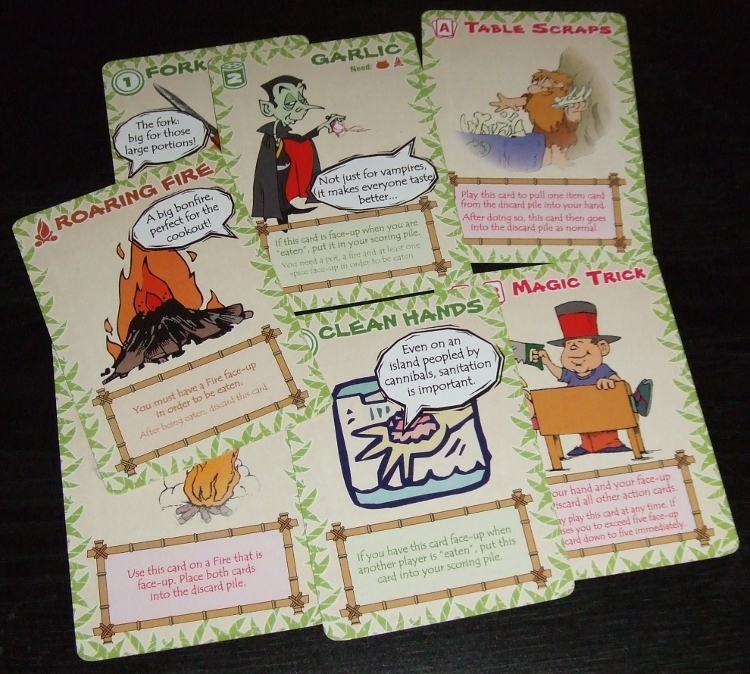 SIT DOWN SERVICE FOR TWO: Two copies of the basic game and two promo cards, shipped to you. International backers, please add $5 for shipping. FORMAL DRESS FOR THE MAIN COURSE: You'll get everything included The Main Course as above and you'll get your choice of one male or female T-Shirt with the Who's for Dinner? logo on it. If you need a shirt larger than 2XL, please add $5. This level includes free international shipping, but due to the larger package, everything will be sent at one time (i.e. you'll get the base game, expansion and T-Shirt by September). FINE DINING FOR TWO: Two copies of the basic game, two promo cards and two copies of the expansion, all shipped to you. As above, the game will ship first, the expansion will follow. International backers, please add $10 for shipping. FORMAL DRESS FOR FINE DINING: You'll get everything included Fine Dining for Two as above and you'll get your choice of two male or female T-Shirts with the Who's for Dinner? logo on it. If you need a shirt larger than 2XL, please add $5 per shirt. This level includes free international shipping, but due to the larger package, everything will be sent at one time (i.e. you'll get the base game, expansion and T-Shirt by September). ASSISTANT TO THE CHEF: You'll get one copy of everything as above, but you'll also get to be assistant art director for one of the cards. You and I will work together to give the artist a brief for the card, and you'll get to see that art in the final game. Plus I'll send you a special poster of your art, suitable for framing or just showing off! 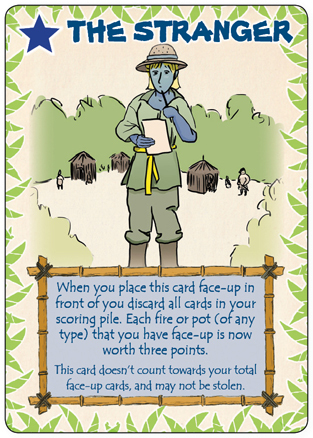 You'll also get your name in the printed rulebook as an assistant art director. Includes free international shipping, if necessary. 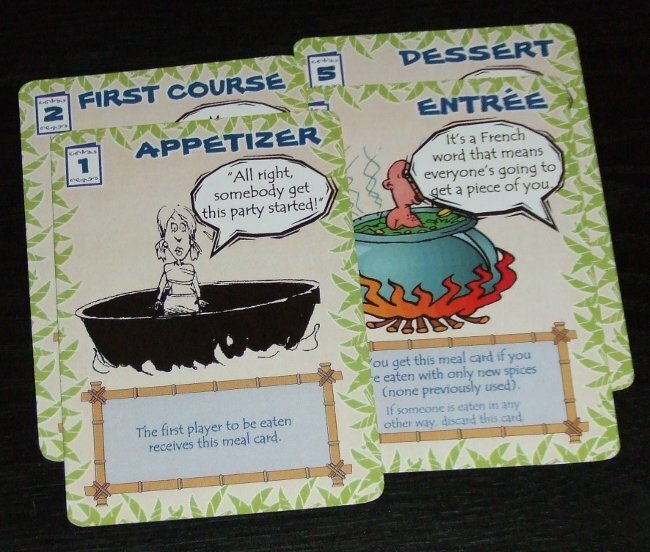 CHEF'S SPECIAL: Take a look through the cards in the playtest edition and pick a card. Then tell us what art and flavor text you want on it. We'll commission unique art for you and print the card. It'll be included in your two copies of the basic game and you'll get the two promo cards and two expansion packs as well. Includes free International shipping, if necessary. Note: Your custom game will ship as soon as available, the September date is for the expansion. PRIVATE DINING PARTY: You'll get everything included in the Formal Dress for Fine Dining package above, and (if you live less than 200 miles away from me), we'll go to dinner at your favorite restaurant and then break in one of your new copies of Who's For Dinner?